Correction: An earlier headline on this story, "4 officers gone from Catoosa sheriff's office," was inaccurate. Two officers are gone. One more was demoted, and a fourth is on administrative leave. In the course of one week last month, one member of the Catoosa County Sheriff's Office resigned, another was arrested, a third got demoted and a fourth announced he was quitting. Deputy Johnathon Frye, facing discipline for shoving an inmate during an argument, served his last day March 23. Three days later, officers in nearby Chattooga County arrested Catoosa Deputy Josh Wilson on charges of stealing a friend's pain medication. Two days after that, March 28, Catoosa County and Ringgold Police Department investigators said they found Cpl. Deric North at a party, drunk and firing a gun into a pit. And on March 30, Cpl. Robert Brown chose to resign rather than be fired for not driving to the scene of a car crash when called. Wilson remained in jail Thursday without bond and is on administrative leave without pay pending an internal investigation. North was not charged for firing a weapon while intoxicated, a criminal offense. Administrators placed him on probation, demoted him to the rank of deputy and suspended him without pay for 16 hours. Sheriff Gary Sisk said that tumultuous week proves he is unafraid to punish members of his department if they deserve it. "This should be a positive article," he said earlier this month when asked about the job status of those four employees. 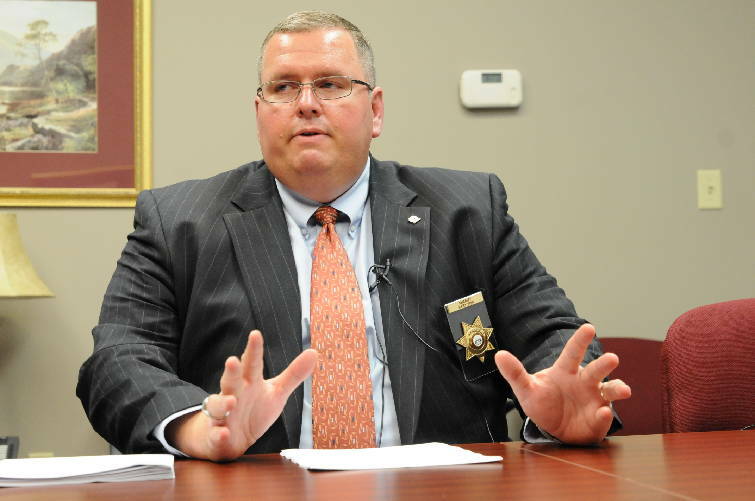 Catoosa County (Ga) Sheriff Gary Sisk makes a statement at the Sheriff's Department in this 2014 file photo. Brown disagreed and said office politics were at work. He said he had to resign because of a minor policy violation while North, who might have committed a crime, was only demoted. He thinks his bosses were trying to find an excuse to fire him because he had "personality conflicts" with a captain. "I could almost see the writing on the wall," he said. "I was waiting for something else (to happen to me)." However, Brown's personnel file shows that in his 11 years with the department he had been disciplined five times. He crashed his patrol car twice, put handcuffs on a girl whom he was not arresting and drew a handgun during a traffic stop. He was on disciplinary probation because a Hutcheson Medical Center nurse complained in December that he was rude to her. Three witnesses supported the nurse's claim, though the file does not explain how Brown acted rudely. Brown said he was checking on an injured inmate and asked the nurse why the inmate didn't have an IV inserted. He said he also asked the nurse to check the inmate's ankles. In March, Brown was supervising four deputies on patrol when someone called 911 to report a car crash. The deputies were already handling other complaints, Brown said, so he was supposed to go to the crash, even though Georgia State Patrol investigators are the ones who actually examine the scene. In this case, Brown said, another 911 call came in, so he told a dispatcher to let him know if the GSP was going to be late to the scene, and he went to the other call. He planned to go to the crash afterward, but he forgot. That was a mistake, he admits. Administrators told him he could step down or be fired. Sisk said the punishment was based on Brown's transgressions. "He was not forced to resign," Sisk said. "If someone is shown their options and they make a choice, it is their choice." Brown, though, points to lesser punishment for North. Before last month, North had been disciplined five times in 11 years, his personnel file shows: for sleeping on duty, looking at a confidential file without permission and forgetting to put his car in park during a traffic stop, so that his vehicle rolled intothe offender's. Soon after midnight on March 28, members of the Ringgold Police Department and Catoosa County Sheriff's Office responded to a complaint of someone firing shots at a party on Debra Lane in Ringgold. Multiple incident reports said investigators heard five gunshots and found North in the backyard, smelling of alcohol and showing "other obvious signs of impairment." North told Catoosa County Cpl. Chris Faulk he had shot into the fire pit. But though it is a misdemeanor under Georgia law to discharge a firearm with a blood alcohol content above .08, North was not charged. Instead, Faulk asked North to call a friend who could drive him home. When that was unsuccessful, Faulk told a deputy to give North a "courtesy ride." Sisk said members of his department did not test North's blood alcohol content.